A Kid and Adult Favorite! Do you need a dessert that's a true crowd pleaser? How about a new take on a old classic? Sprinkles, Jimmies, Large Sanding Sugar, etc . . .
Take 3-4 cones and fill them to various levels - remember the cake will expand! Put filled cones on rimmed cookie sheet and carefully place in oven. Cook for ~20-25 minutes. Keep an eye on them and let cupcakes get a little more golden brown than you typically would. You want to ensure that the very base of the cone is cooked through. This is a very important step, a couple of your cupcakes will probably spill over onto the cookie sheet, hopefully one of them is just perfect and you remember what fill level to use for the rest of the batch! Fill the remaining cones with cake batter (I use a large mixing spoon) using the LEVEL YOU DETERMINED WAS APPROPRIATE FROM STEP 4. Place filled cones onto a cookie sheet (I prefer a rimmed jelly roll pan in case I get spillage) - you can put them pretty close together. Remove from oven and let cool on the cookie sheet. You can use a variety of frosting and decorating techniques - it's really dependent upon how much time and patience you have. 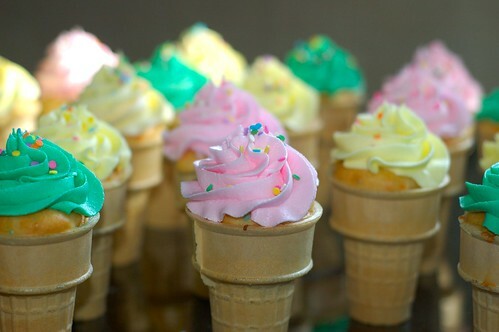 You can frost each cupcake using a knife and "swirling" the frosting to make it look ice cream like. You can also take store bought frosting and color it with gel food coloring to spice things up. I believe that they should always be topped with some type of sprinkle - but again, that's up to you. I like to make my frosting (recipe coming eventually) and pipe it onto each cupcake using a large star tip. I then sprinkle each cupcake right after piping to make sure the sprinkles really "stick" in the grooves before the frosting sets. I buy almost all of my decorating supplies from Bake it Pretty - they have a large selection and also offer a great "Cupcake Decorating Kit". Let me know if you try these out. I just brought them to a party on Saturday night and I think they were a hit - all 20 cupcakes were gone and most of the adults went back for seconds! I'm going to make these with my nieces over Christmas break. Thanks for posting the recipe! Ok, so I tried to make these for my soccer team last Spring and it didn't work well for me. You'll have to let me know how full you make your cones. Also, I would be interested in your icing recipe. Matt and I have determined that we need to make our own because the frosting that we use isn't doing what we'd like it to (it's not stiff enough).